Natures Aid Quercetin Formula is an advanced formula containing Ester-C, Highly absorbable, non-acidic Vitamin C.
Quercetin, Methyl Sulphonyl Methane, Ester-C ®, (Calcium-L-Ascorbate), Cellulose, Pantothenic Acid (as Calcium Pantothenate), Liquorice Extract Prep (Liquorice Root Extract, Maltodextrin, Silicon Dioxide), Microcrystalline Cellulose, Pine Bark Extract, Anticaking Agents (Vegetable Source Magnesium Stearate, Silicon Dioxide). Take 2 Vegicaps a day with food. Do not exceed recommended daily intake. This product is not recommended for use during pregnancy or when breastfeeding. 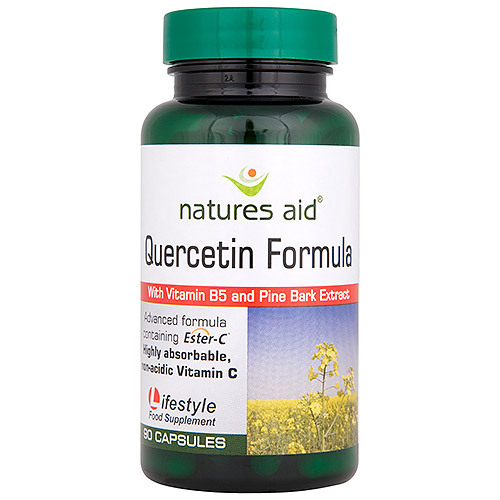 Below are reviews of Natures Aid Quercetin Formula + Vitamin B5 -90 Vegicaps by bodykind customers. If you have tried this product we'd love to hear what you think so please leave a review.